Impressions of a Reader...: 2012 Science Fiction Experience: Science Fiction "B Movies"
We watch some B sci fi movies sometimes too. I can't recall any titles right now (they're THAT memorable)--I'd have to look through our past movie queues-- but at the time we're watching them, they're entertaining enough. Christine, that's too funny. They're that memorable? No titles? That's too good. I remember them because after a while I wind up watching some of them over and over again. As soon as we see a sci-fi B movie come on we run to get the popcorn ready. Not sure I would classify Pitch Black as a B film, but that is just a niggling point. It is a really fun movie, best watched of course with all lights out. I can't recall if I've seen Soldiers or if I just know so much about it that I think I've seen it. I noticed it on Netflix streaming the other day and almost watched it just because once in awhile a Kurt Russell action flick is the perfect answer to scratch that entertainment itch. Seriously though, Soldier by Russell doesn't really qualify as a "B" movie. If I think about budget, it's more of a financial flop. However, although as you say his movies are always, always great for entertainment. This one is not an exception. Isn't that the truth. The budgets of what would now be considered B movies is certainly very different from what it was back when the phrase was first coined. If you're looking for little-known SF movies that are worth watching and also have great eye candy, try Equilibrium, starring Christian Bale (yum!) with Sean Bean and Taye Diggs (more yum!) It's based on an interesting worldbuilding concept, too. Equilibrium is very good. The gun-kata can be a bit silly if you are overcritical, but by and large it really is a great undersung sf movie. Angie, you like Vin Diesel? You're too much fun! The Chronicles of Riddick was more interesting to me than Pitch Black, although again not a Hugo contender either. Carl V., undersung is the perfect word for that film! Although, of course in my humble opinion the gun-kata is what brings a bit of fun to the whole. Angie! I love that you watch just the gun-kata. My husband would do that! LOL! Don't get me wrong, I like the gun-kata, but it has been the one part of the movie that has given some friends a chuckle and if anyone has heard of that and would consider it silly I always want to say that the film as a whole is excellent. I wish I had seen it in the theater. 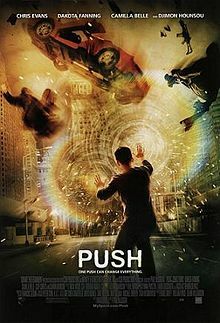 I loved Push and Pitch Black. 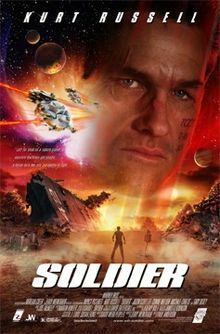 I hadn't heard of Soldier, but will be checking it out. I also enjoyed the Chronicles of Riddick. My brother makes fun of me cause I'm addicted to these types of movies lol..
Mariana, Push has an interesting premise, right? I've seen it a couple of times and always wonder at the end if they plan to do a sequel or if they will. There's just room there for more.